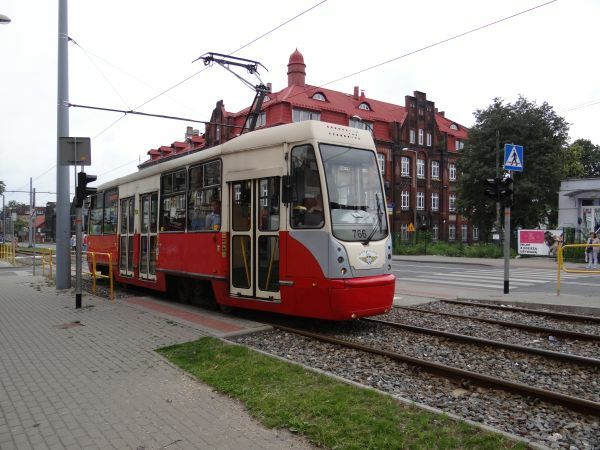 The tram network of Elblag is the second oldest in Poland after Warsaw. 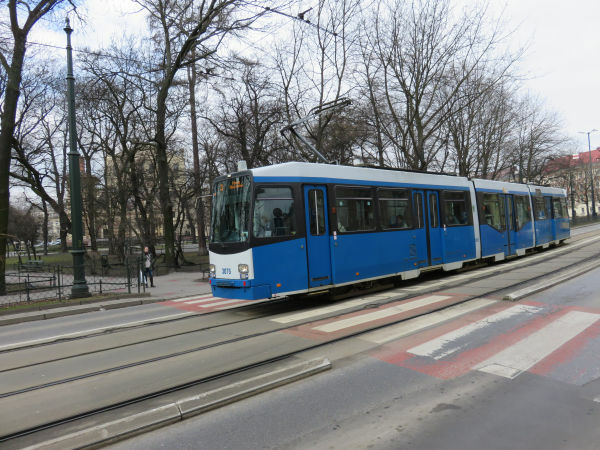 Currently there are 5 tram lines with a total length of 32 km. This old tram looks like an old Tatra, but it is not. 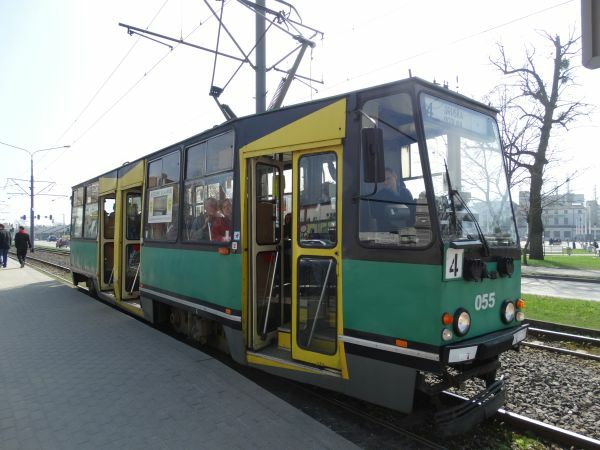 It is a Konstal 805Na, in use in Elblag since 1980. There are 21 of them and it is the most common tram type in Elblag. Picture at the Elblag train station tram stop 4.4.2017 by Ilkka Siissalo. 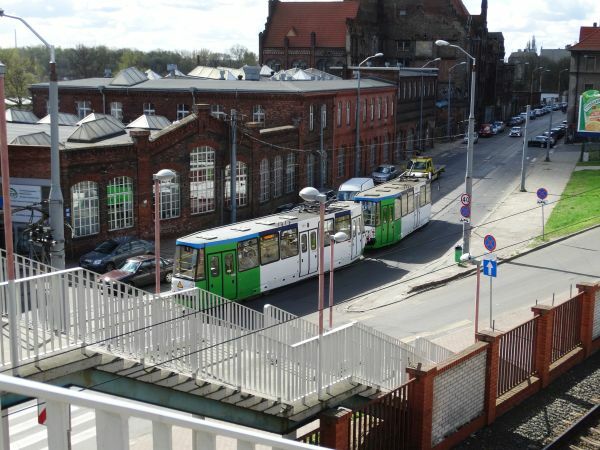 Another view of the same Konstal tram of Elblag. 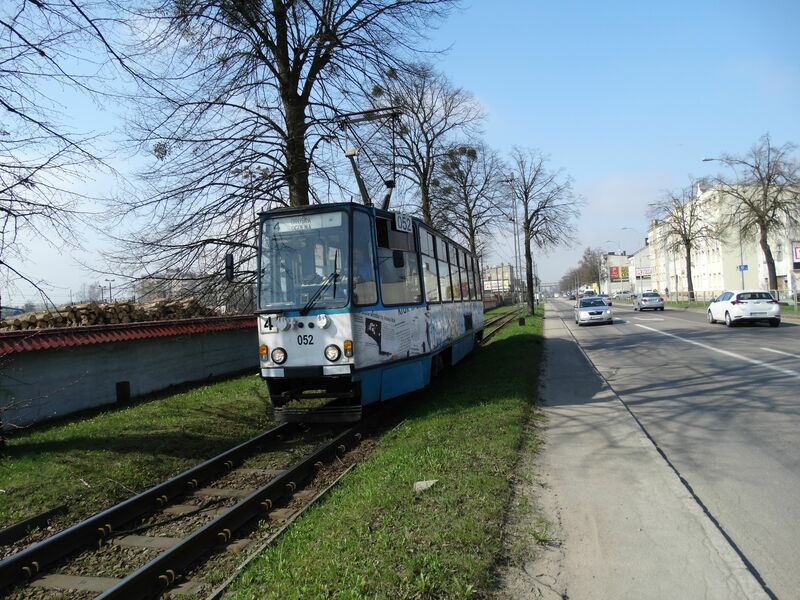 Picture at the Elblag train station tram stop 4.4.2017 by Ilkka Siissalo. 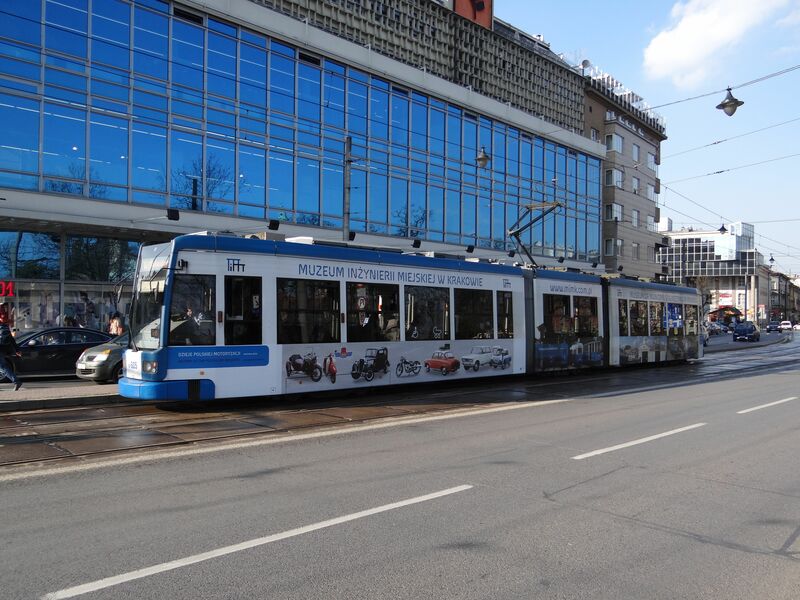 Another Konstal tram. 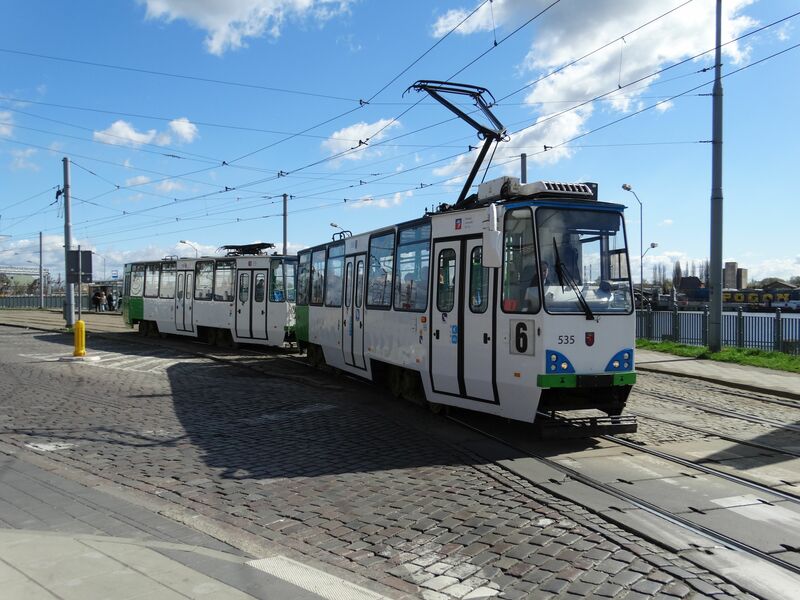 Almost every tram individual has different colours. Picture at the Elblag train station tram stop 4.4.2017 by Ilkka Siissalo. 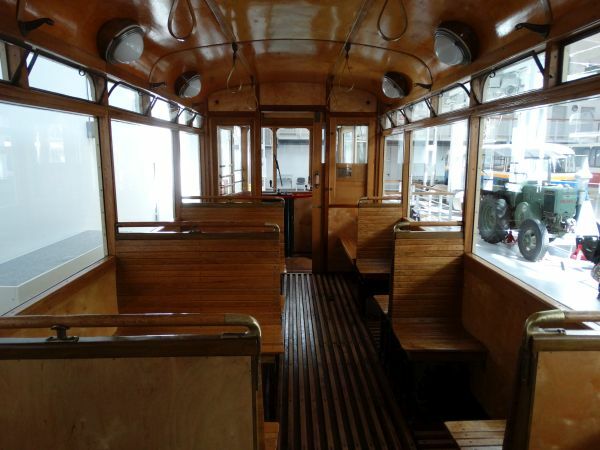 Same tram as above, but seen from the other side. Picture at the Elblag train station tram stop 4.4.2017 by Ilkka Siissalo. 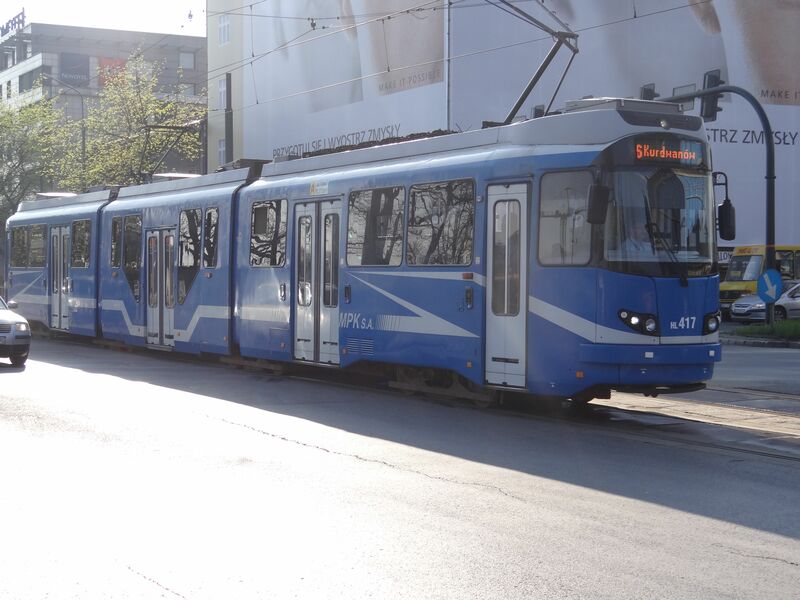 Some of the trams are totally or partly covered by ad stickers. A part of the network is single track and the trams have to wait for others coming from the opposite direction. Picture at the Elblag train station tram stop 4.4.2017 by Ilkka Siissalo. Gdansk tram no. 1173 is a Modertrans Moderus Beta, modernised since 2009 from trams originally built 1979-82. It has a driver's cab at both ends and doors on both sides. Picture by the Gdansk main station 4.4.2017 by Ilkka Siissalo. 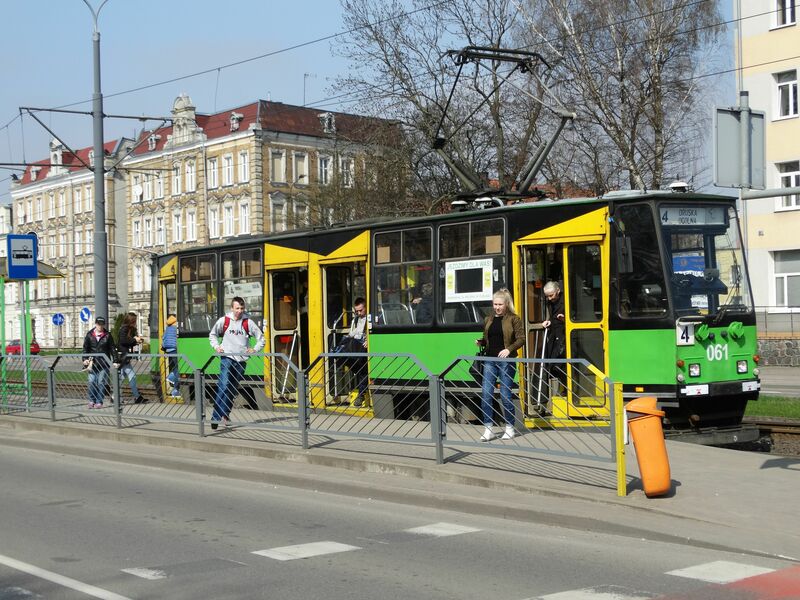 Gdansk tram no. 1122 is a similar Modertrans Moderus Beta as in the picture above, but this time the other way round in this picture. Note how the pantograph is now at the very end of the tram. Picture by the Gdansk main station 4.4.2017 by Ilkka Siissalo. 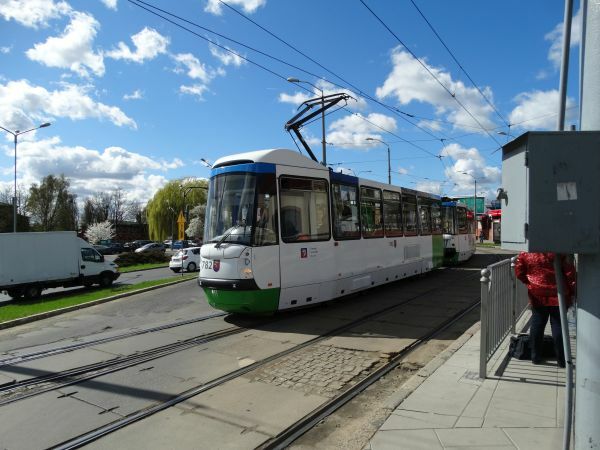 Pesa's tram type 120Na "Swing" is one of the newest tram types in Gdansk. there are 35 of them in the city. Picture by the Gdansk main station 4.4.2017 by Ilkka Siissalo. 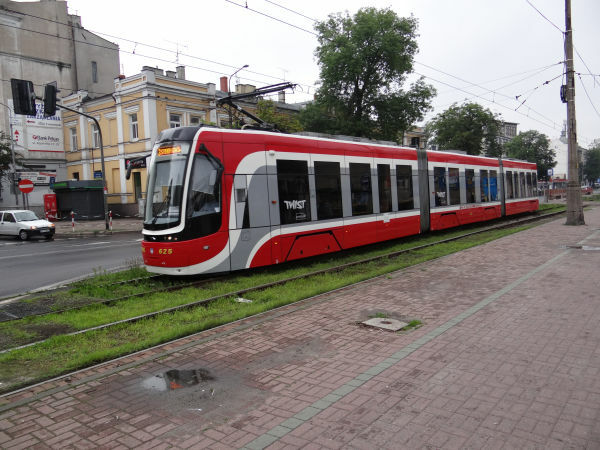 Another view of a Pesa Swing. Picture by the Gdansk main station 4.4.2017 by Ilkka Siissalo. 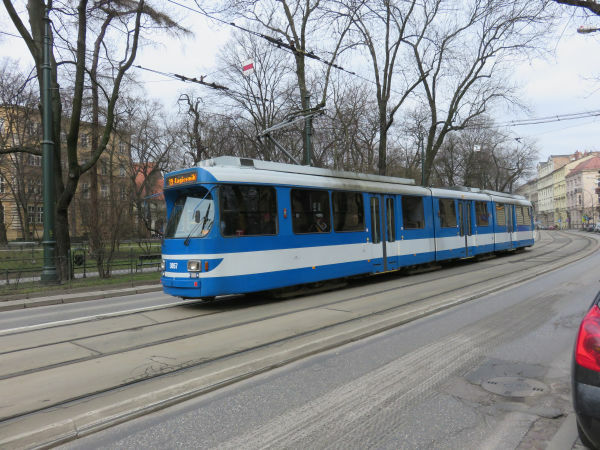 The Pesa 128NG "Jazz" is the newest tram type in Gdansk and there are not yet very many of them in use. Picture by the Gdansk main station 4.4.2017 by Ilkka Siissalo. 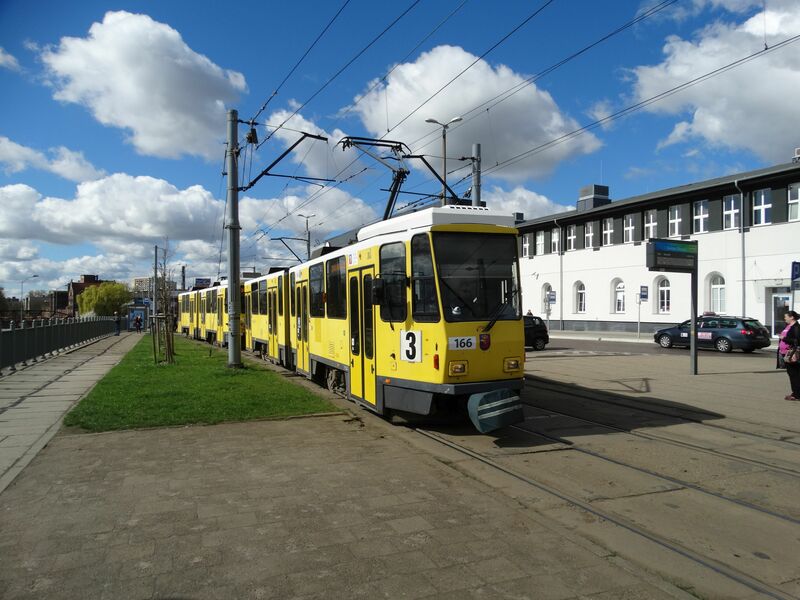 These two trams are among the oldest in use in Gdansk. 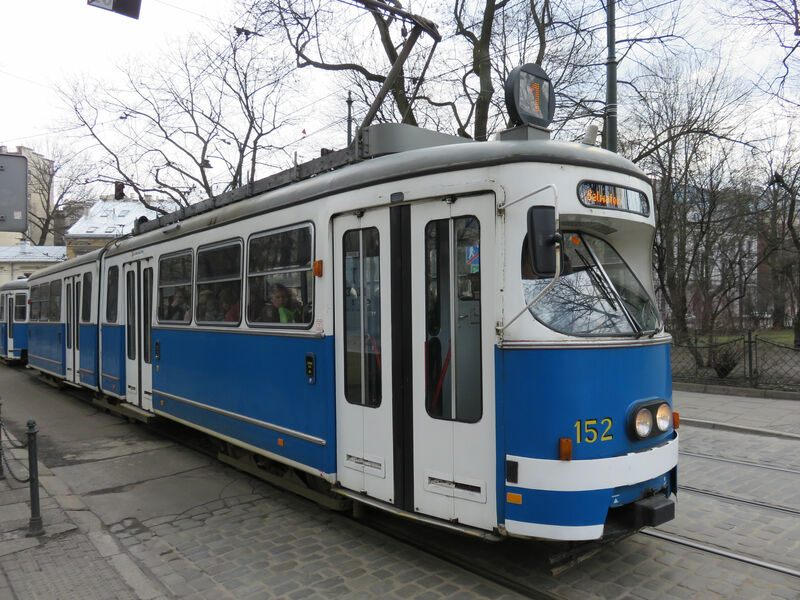 The type is Konstal 105Na, built by Konstal in Chorzow, Poland 1979-92. Picture by the Gdansk main station 4.4.2017 by Ilkka Siissalo. Four Konstal 105Nas in a line. This is a very common tram type in Poland. Over 2100 were built. Picture by the Gdansk main station 4.4.2017 by Ilkka Siissalo. 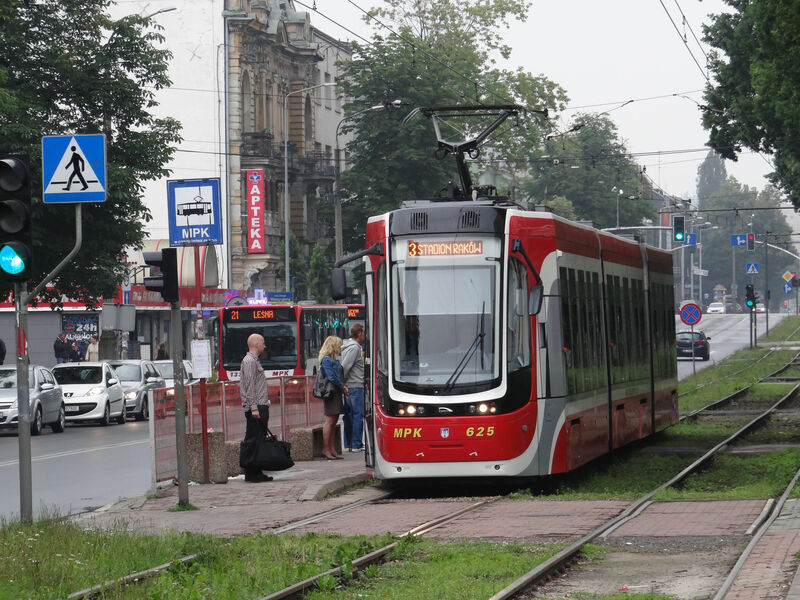 Note the differences in doors of the different Konstal trams. Picture by the Gdansk main station 4.4.2017 by Ilkka Siissalo. Another Konstal 105N tram pair at the Gdansk main station, but here the first one has received a new front part and has been partly modernised. Picture at Gdansk Glowny 27.12.2017 by Timo Varshukov. 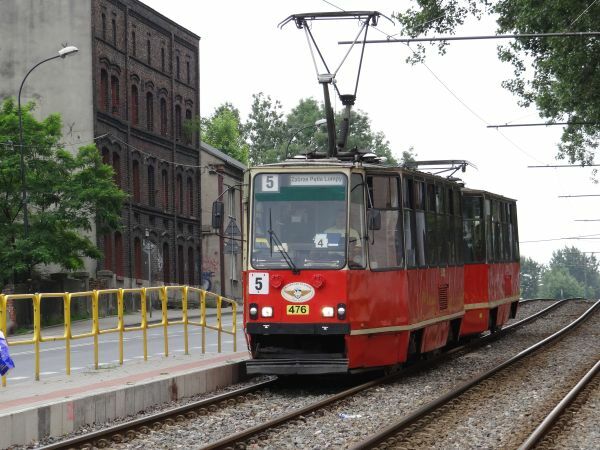 A Bombardier NGT6 tram on the Zwierzyniecka road in Krakow. 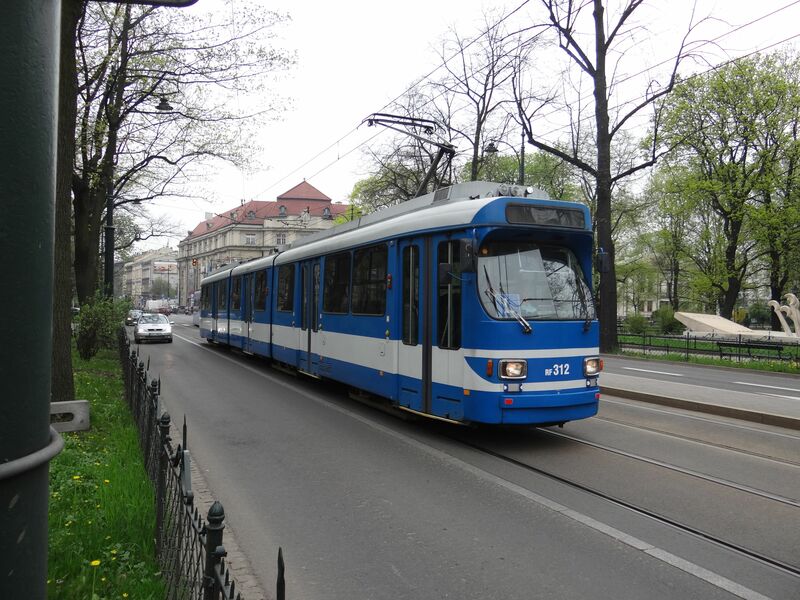 These trams were bought in 1999 and they were the first really modern western trams in Krakow. Picture 13.4.2016 by Ilkka Siissalo. 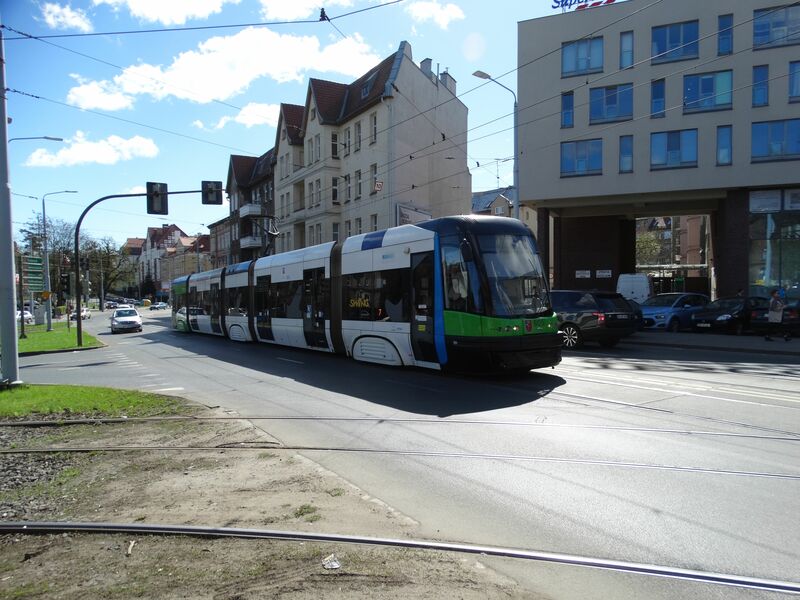 Another Bombardier NGT6 tram on line 8 on the Juliana Dunajewskiego road in Krakow by the old town. Picture 14.4.2016 by Ilkka Siissalo. Bombardier NGT6 trams were ordered to Krakow in three batches 1998, 2001 and 2007 and the latest ones look a bit different from the first ones. Compare the front of this one with the picture above. 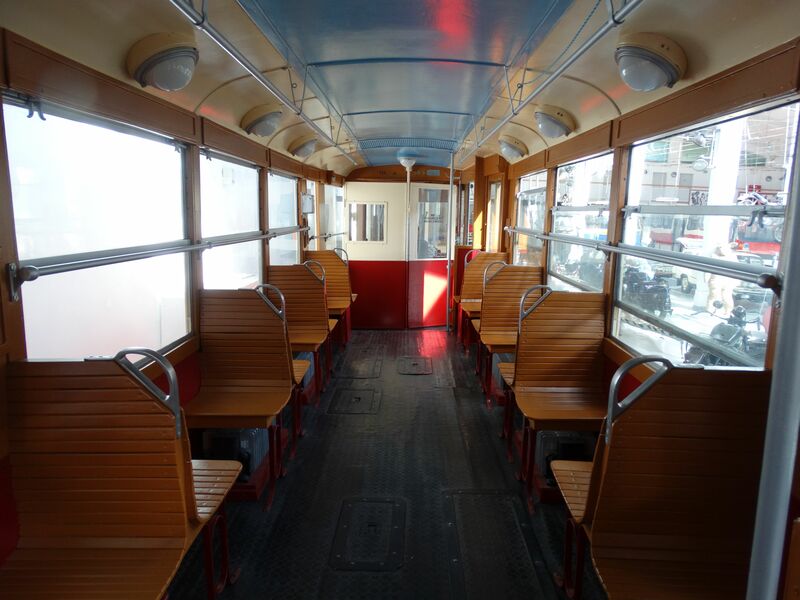 On the right the back of an old Wien tram. 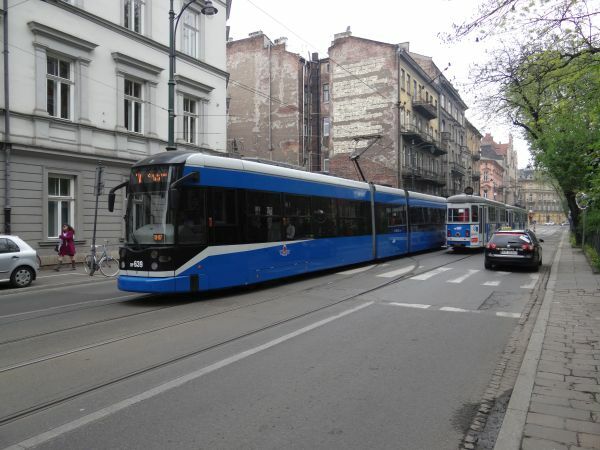 Picture on the Juliana Dunajewskiego road in Krakow 14.4.2016 by Ilkka Siissalo. This one is the Bombardier NGT8K. 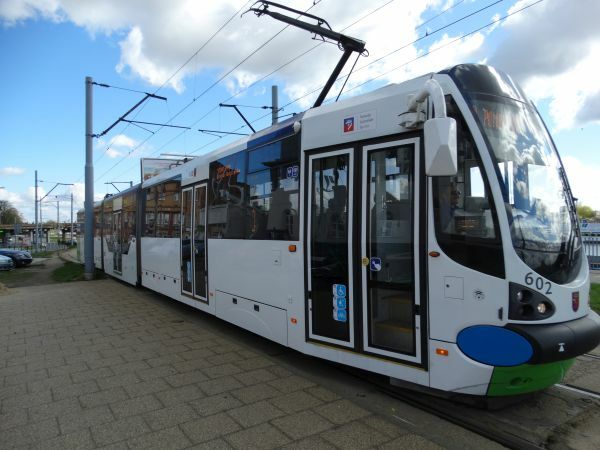 It is based on the NGT6K tram model shown above, but is newer and longer and has 8 axles. MPK ordered 24 of them in 2012. Picture on the Juliana Dunajewskiego road in Krakow 14.4.2016 by Ilkka Siissalo. Another NGT8K at the Franciszkanska road 14.4.2016. Picture by Ilkka Siissalo. 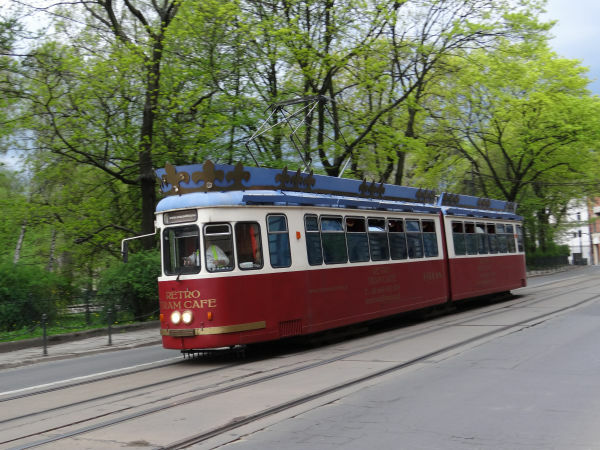 The EU8N trams are really heavily rebuilt old trams of Wien, Austria, which were fitted with new low floor pieces. 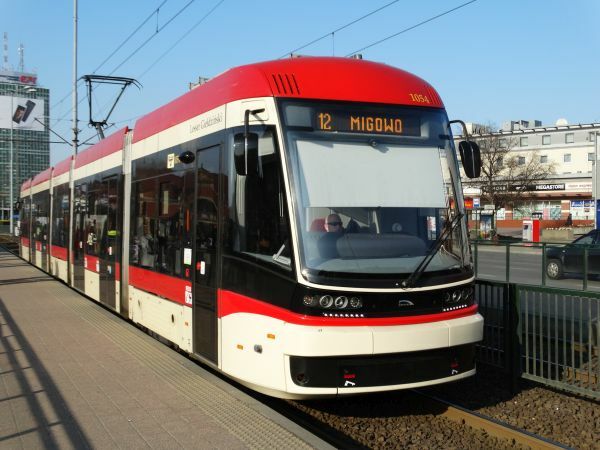 The rebuilding was done by the company Autosan and by MPK Krakow itself. 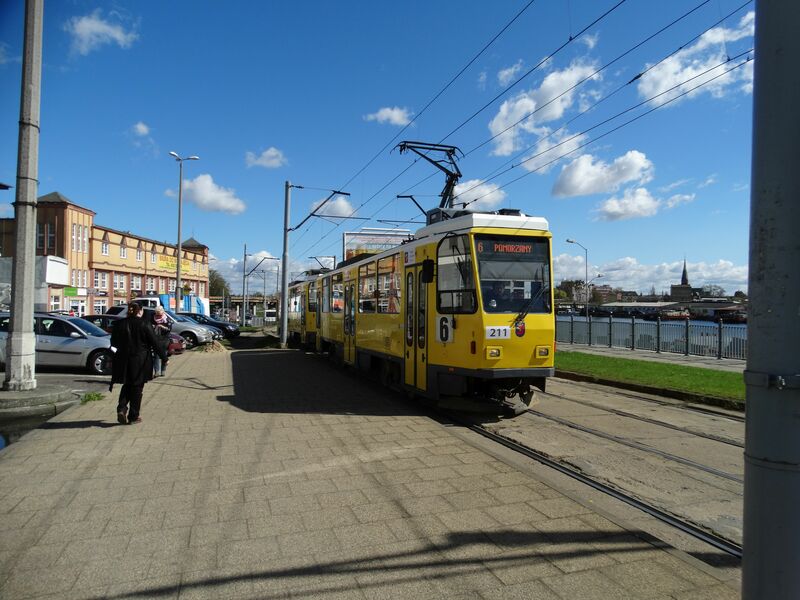 The trams still bear some resemblance to the original German Düwag designs that they are based on. Picture at the Zwierzyniecka road 13.4.2016 by Ilkka Siissalo. 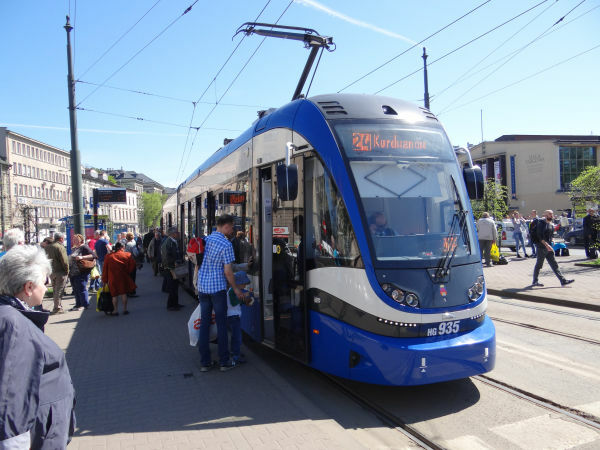 The MAN N8S-NF trams were bought used from Nürnberg, Germany. But this individual is special even among the Nürnberg trams: the front part is unique and differs from the rest of them. Picture at Basztowa road 5.3.2015 by Ilkka Siissalo. 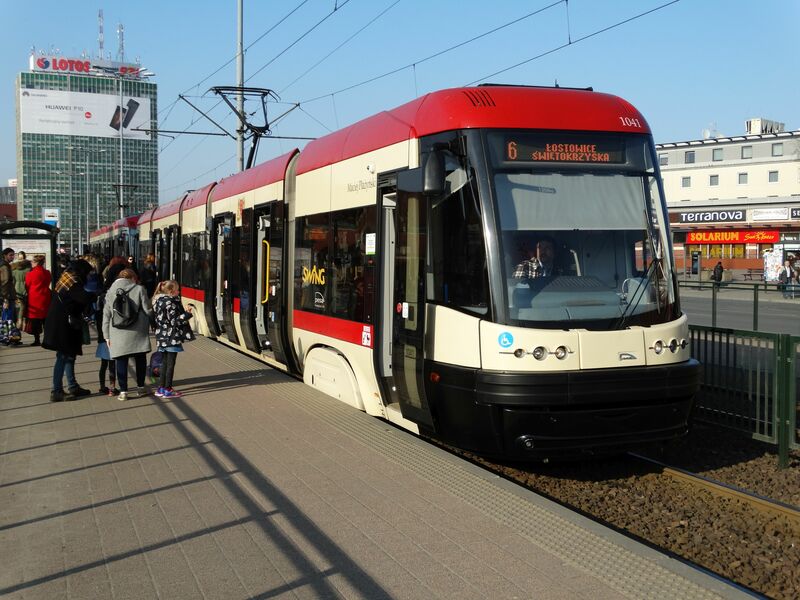 This is how the "regular" MAN N8S-NF trams from Nürnberg look like. Note doors on both sides and drivers' cabs at both ends. Picture at Westerplatte road 5.3.2015 by Ilkka Siissalo. Another MAN N8S-NF tram from Nürnberg, but this time with a totally different painting. This is typical of Krakow, the livery of the trams can significantly differ from wagon to wagon. Picture at Westerplatte road 28.12.2017 by Timo Varshukov. 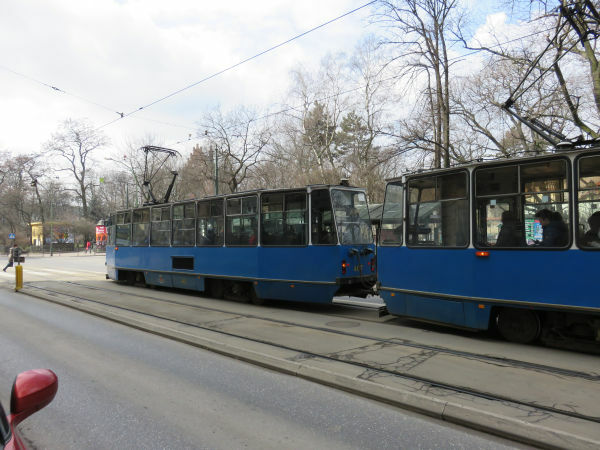 These E1 trams and their C1 unmotorised trailers are used trams of Wien, Austria. They are of a German design of the company Düwag but built under license in Austria between 1966 and 1976. 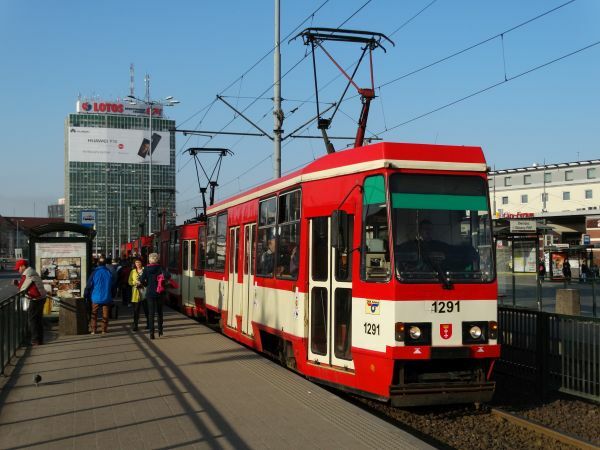 MPK bought 72 of them used from Wien in 2004. 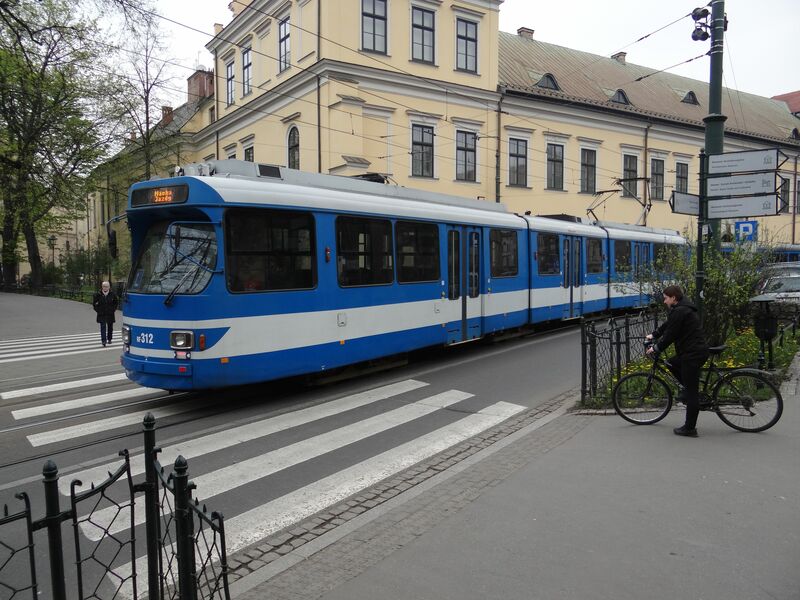 Picture at the Juliana Dunajewskiego road in Krakow 14.4.2016 by Ilkka Siissalo. 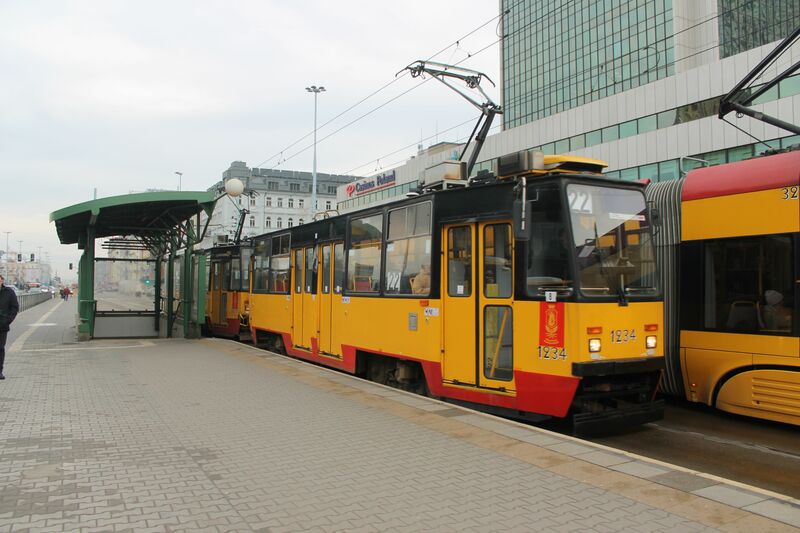 This one is also a K1 from Wien which has a C1 trailer wagon but in a little different painting scheme. Photo at the Westerplatte road 14.4.2016 by Ilkka Siissalo. 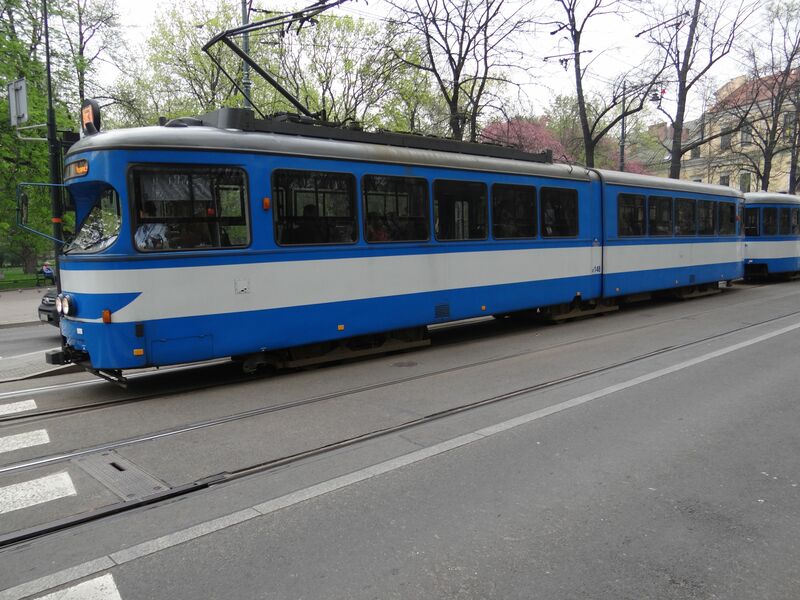 Same tram as in the picture above; this is the C1 trailer from Wien. Photo at the Westerplatte road 14.4.2016 by Ilkka Siissalo. One of the oldest K1 trams originally from Wien, this no. 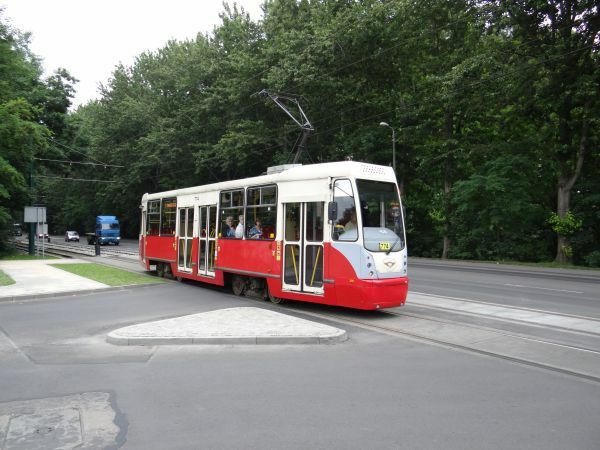 152 is seen here turning from Westerplatte to Dominikanska road on line 1. Picture 5.3.2015 by Ilkka Siissalo. 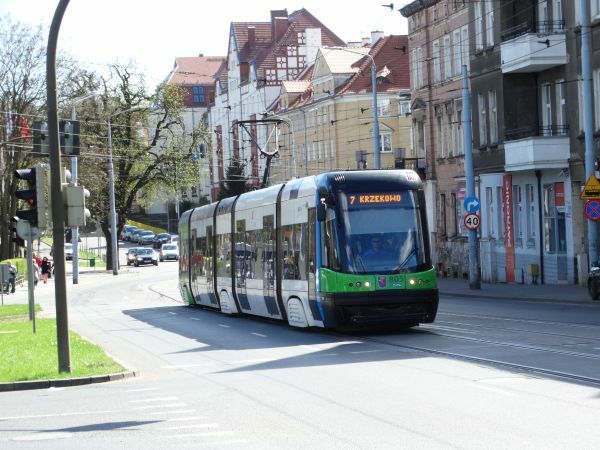 Same K1 tram no. 152 as above, here turning from Westerplatte on Dominikanska road on line 1. Picture 5.3.2015 by Ilkka Siissalo. Still the same K1 tram no. 152 as in the two pictures above, on Dominikanska road on line 1. This shows the very typically Austrian Düwag trailer coach. Picture 5.3.2015 by Ilkka Siissalo. 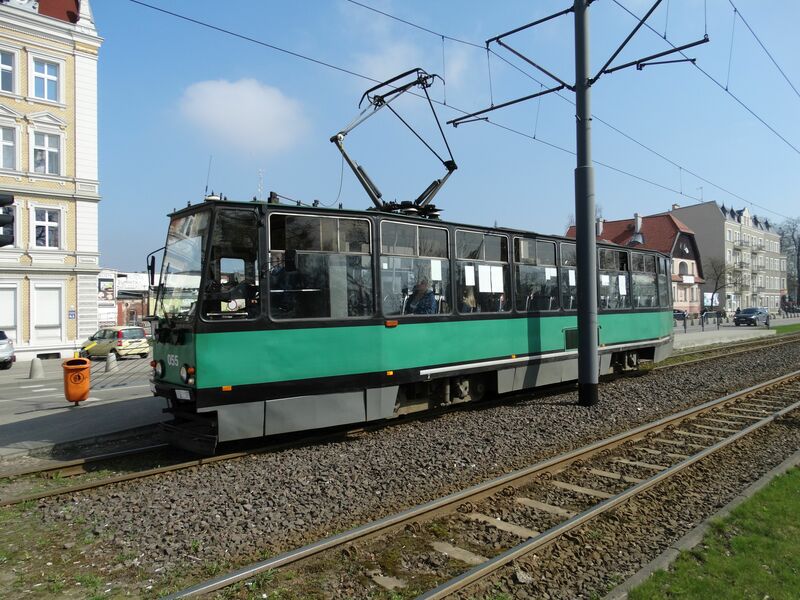 This is one of the eight axle Düwag GT8S trams bought used from Düsseldorf, here at the Franciszkanska road. These had been built 1973-75 by Düwag. Picture 14.4.2016 by Ilkka Siissalo. 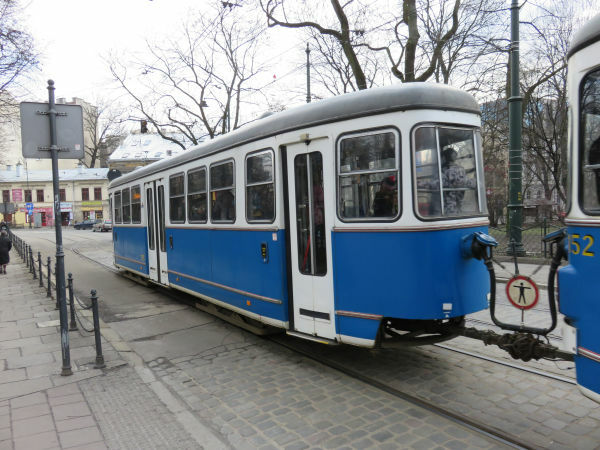 Same tram as in the picture above. The long Düsseldorf trams had drivers cabs at both ends and doors on both sides. 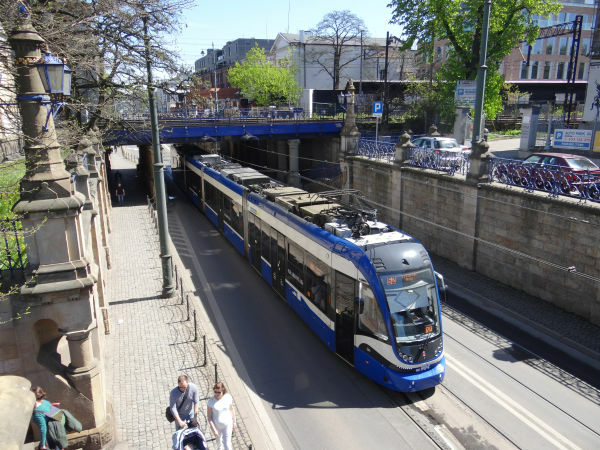 This is one of the eight axle Düwag GT8S trams from Düsseldorf, here at the Franciszkanska road. Picture 14.4.2016 by Ilkka Siissalo. Another one of the Düwag trams with drivers' cabs at both ends, this time on Westerplatte street in downtown Krakow. Picture 5.3.2015 by Ilkka Siissalo. These old Konstal 105Na trams were once common everywhere in Poland. They were produced under a very long period 1979-92 basically identical. 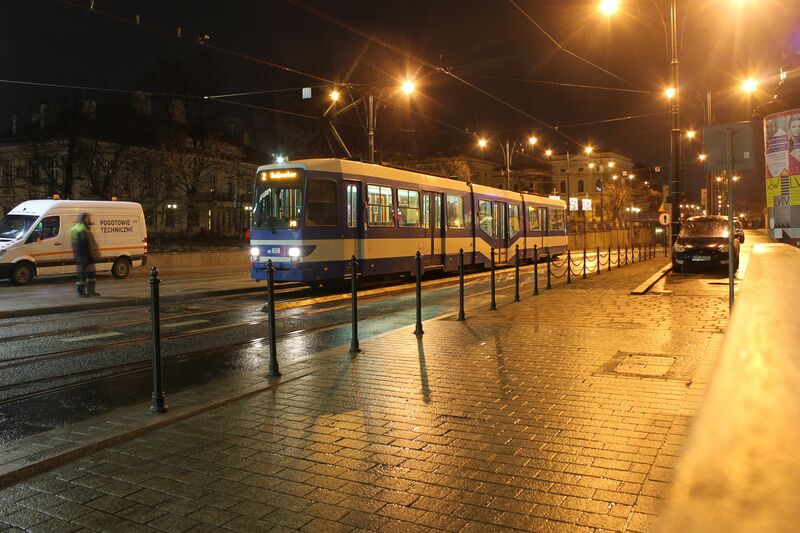 But due to their poor quality they are prone to frequent breakdowns and in Krakow they have become rare. Photo at the Westerplatte road 14.4.2016 by Ilkka Siissalo. 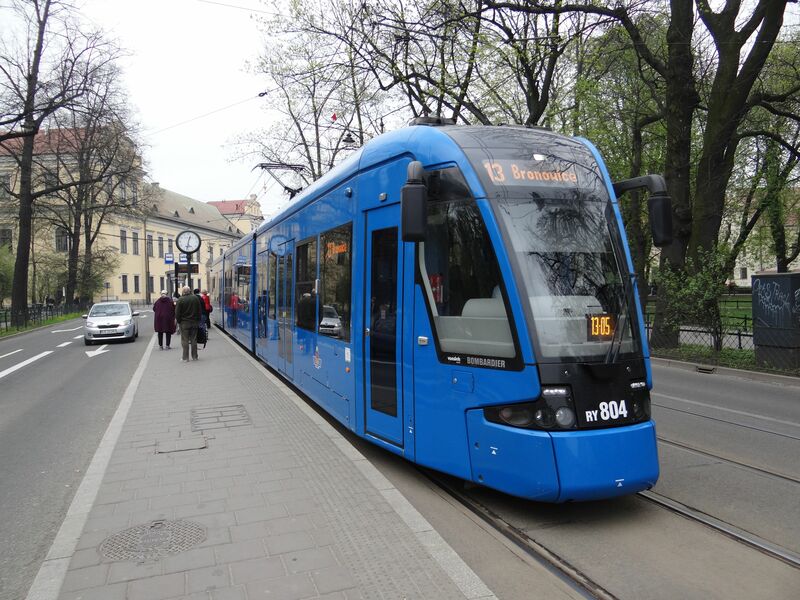 Another view of the same Konstal 105Na trams. Photo at the Westerplatte and Pawla road crossing 14.4.2016 by Ilkka Siissalo. 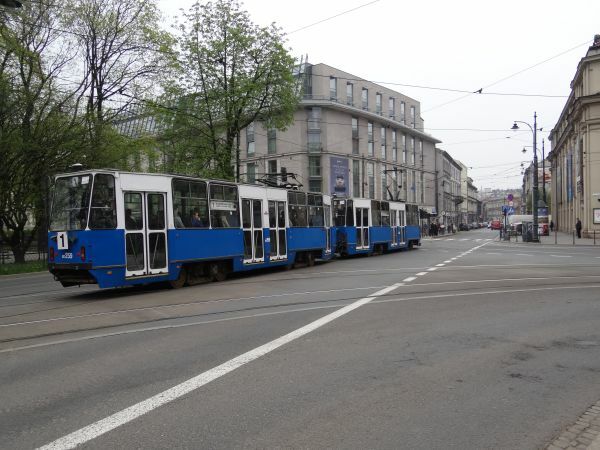 Three old Konstal trams forming a three coach tram train. Picture at Westerplatte street 15.3.2015 by Ilkka Siissalo. The Pesa 2014N Krakowiak is the newest tram type of Krakow and it is also the longest tram of the whole Poland with its length of 42,83m. They have been in use since 2015 and MPK has 36 of them. Picture from the Hala Targowa (Targow market hall) tram stop 17.4.2016 by Ilkka Siissalo. 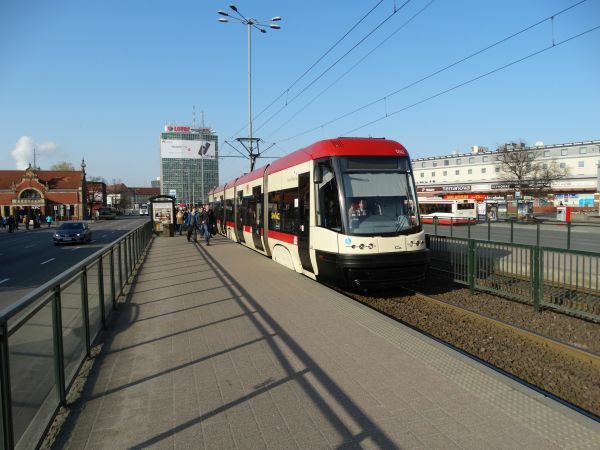 Another view of a Pesa Krakowiak. It looks immensely long, but actually it is not at all unique. In many other European countries new trams are even longer than this one. 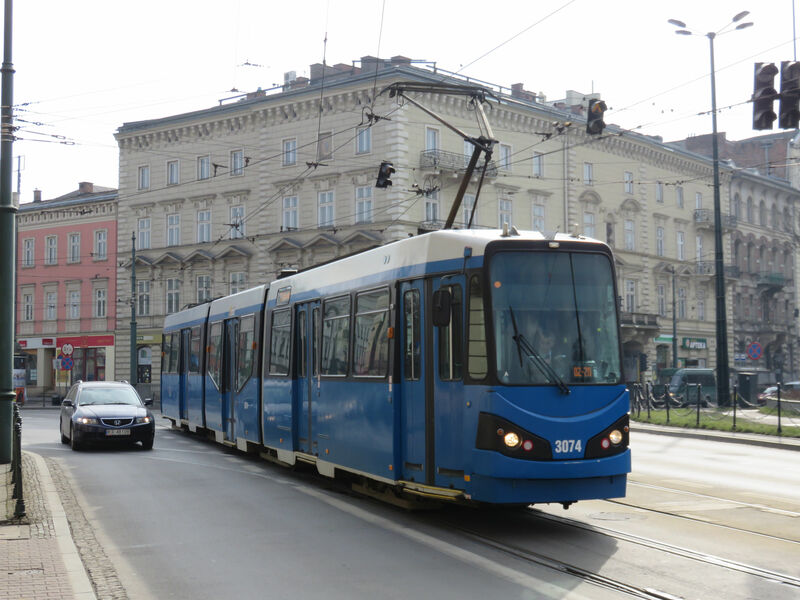 Here the tram is just coming from Lubicz street and continuing on the Basztowa street close to the main station of Krakow. Picture 16.4.2016 by Ilkka Siissalo. Yet another Krakowiak, this one on line 52 at the Juliana Dunajewskiego street near the old university buildings. Picture 14.4.2016 by Ilkka Siissalo. A new Krakowiak seen from above. Picture from close to Krakow Glowny (main station) 17.4.2016 by Ilkka Siissalo. 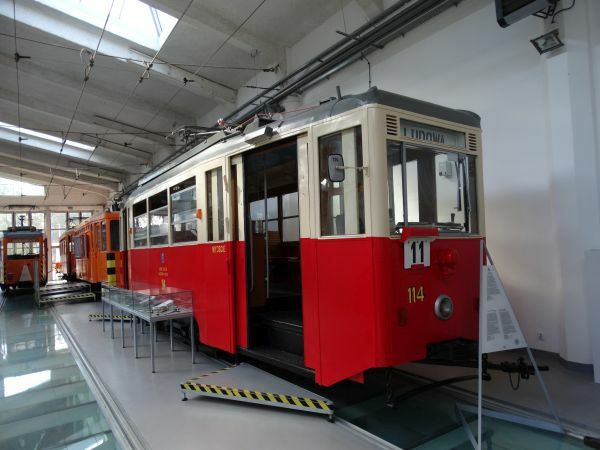 The "Retro Tram Cafe" is an old Düwag tram, originally from Nürnberg in Germany. It was built by Düwag in 1962 as a class GT6 tram for Nürnberg and it was used in Krakow until 2007 as a regular tram. 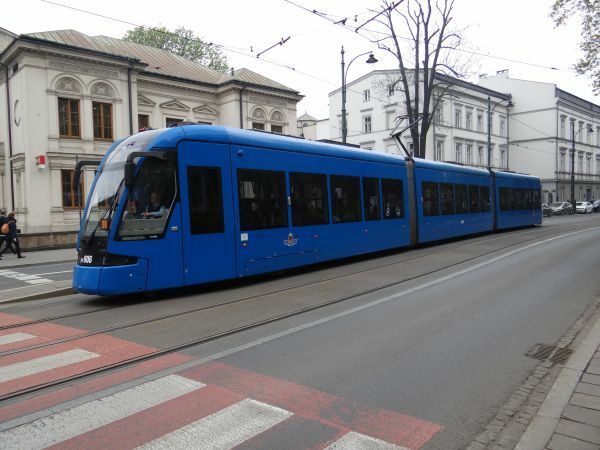 Then two companies, travel agency Jordan and the company Przewłocki i Spółka got the idea to buy it, fit it to become a very old-fashioned luxury restaurant car and let it ride throughout the city of Krakow whilst the guests can have a good drink or even a full dinner. It has been a success. They have two routes: "The Krakow of the kings" and "The socialist Krakow". 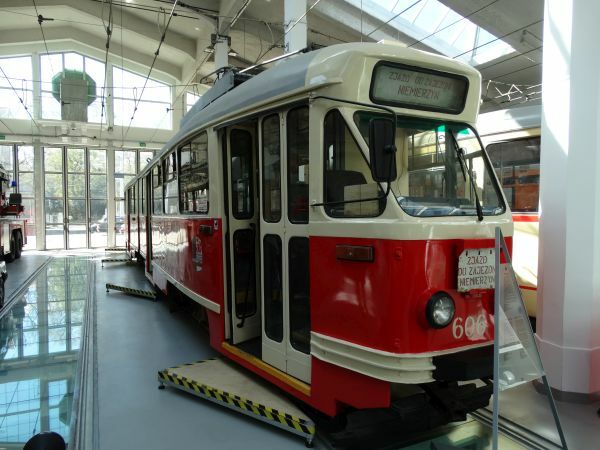 The tram has also often been used for causes of charitable common benefit, such as the blood donation campaign "Wampiriada". Picture 16.4.2016 by Ilkka Siissalo. 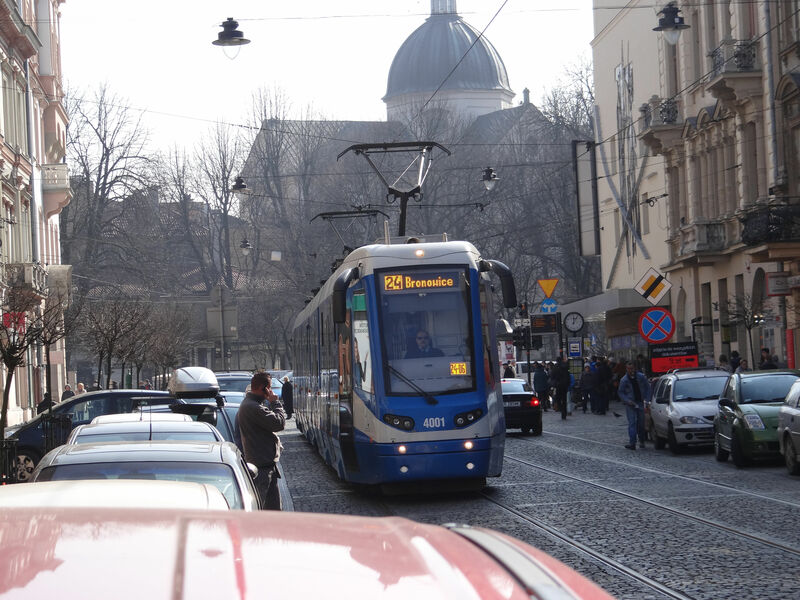 For a while the MPK of Krakow loaned a tram of the type Solaris Tramino to test it out in real traffic in Krakow. The tests however did not lead to purchasing Traminos. 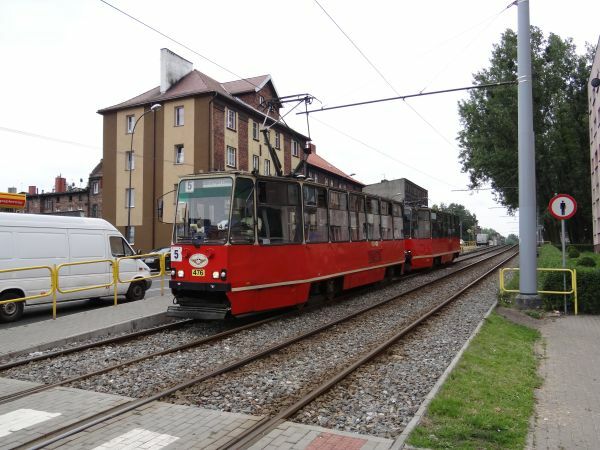 Instead, Krakow chose the longer Krakowiak wagons shown on this page. 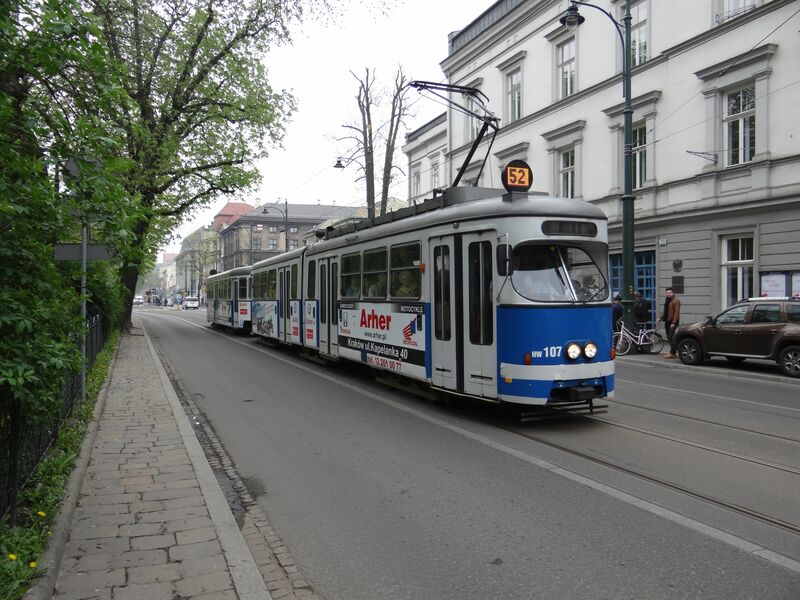 Here the loaned Solaris Tramino is just coming from Zwierzyniecka road and continuing on Dominikanska in Krakow. Picture on 5.3.2015 by Ilkka Siissalo. The MPK of Krakow tram no. 4001 is a strange prototype. It consists of three old but heavily renewed Konstal 105Na trams joined together by new low-floor middle pieces, making up a 40,57 metres long tram with two pantographs. The prototype is called Protram 405N. Here we see the prototype on Jozefa Pilsudskiego street on 7.3.2015. Picture by Ilkka Siissalo. 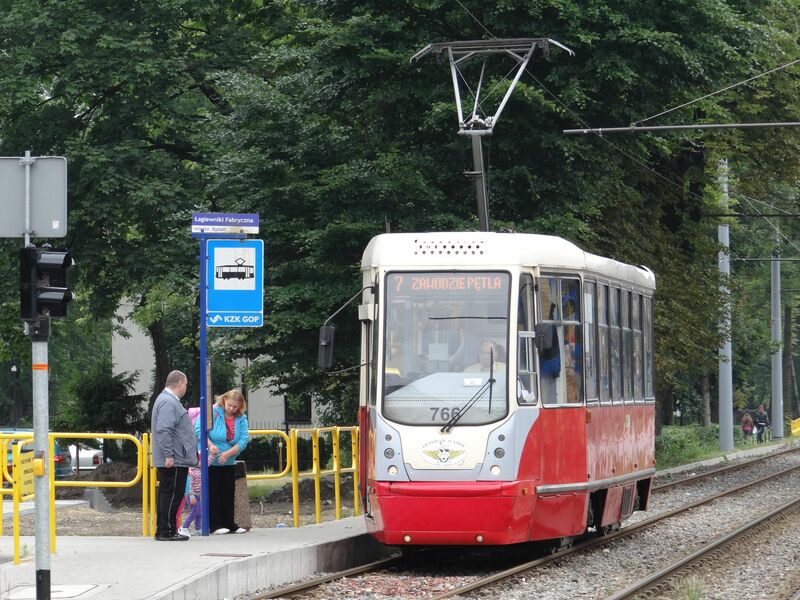 The same loaned Solaris Tramino on Dominikanska road in Krakow. Picture on 5.3.2015 by Ilkka Siissalo. 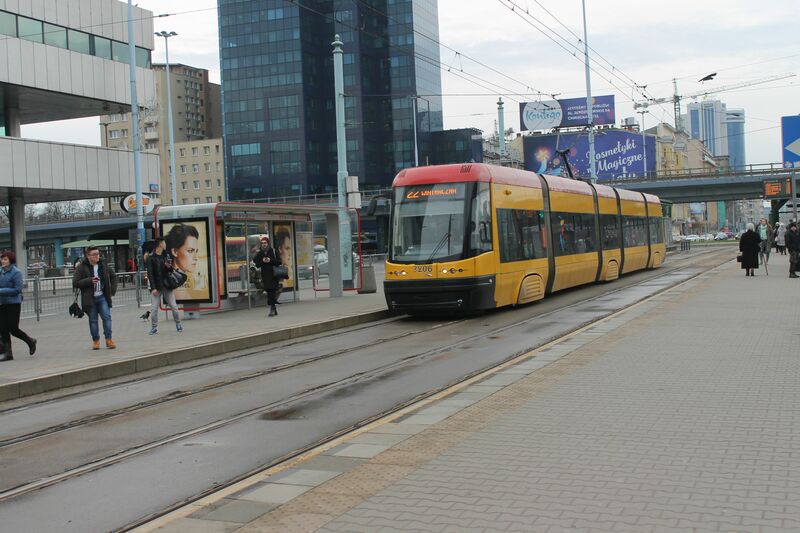 Silesian tramways is one of the largest tram systems in the world. It was opened in 1894, first as a narrow gauge railway. 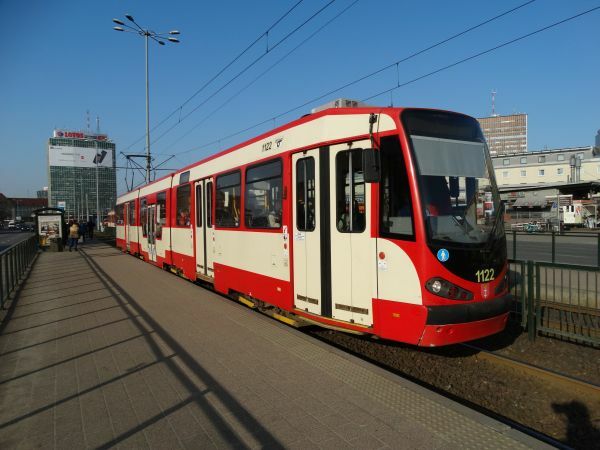 The system is spread over more than 50 kilometres and covers thirteen towns in the Upper Silesian metropolitan area and their suburbs: Katowice, the capital town of the region, Będzin, Bytom, Chorzów, Czeladź, Dąbrowa Górnicza, Gliwice, Mysłowice, Ruda Śląska, Siemianowice Śląskie, Sosnowiec, Świętochłowice, and Zabrze, until 2006 also Piekary Śląskie and Wojkowice. This tram seen here is a Konstal 105N which has been partly modernised by MPK Łódź. Picture from Bytom 29.6.2015 by Ilkka Siissalo. Another picture of the same tram 766 as above. Picture from Lagiewniki Fabryczka tram stop in Bytom 29.6.2015 by Ilkka Siissalo. Two unmodernised Konstal 105N trams in Bytom 29.6.2015. Picture by Ilkka Siissalo. 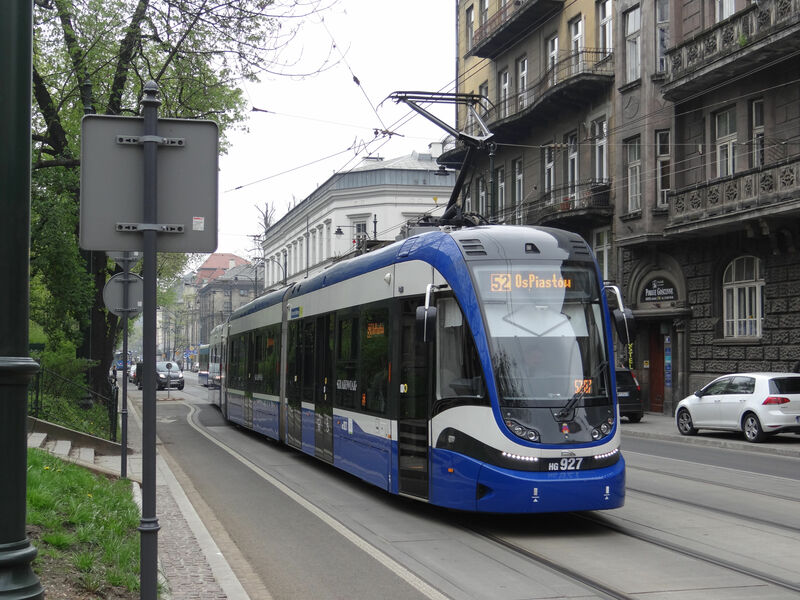 Another picture of the same Konstal 105N tram pair as in the picture above. Picture from Bytom 29.6.2015 by Ilkka Siissalo. Yet another picture of the same Konstal 105N tram pair as in the pictures above. Picture from Bytom 29.6.2015 by Ilkka Siissalo. 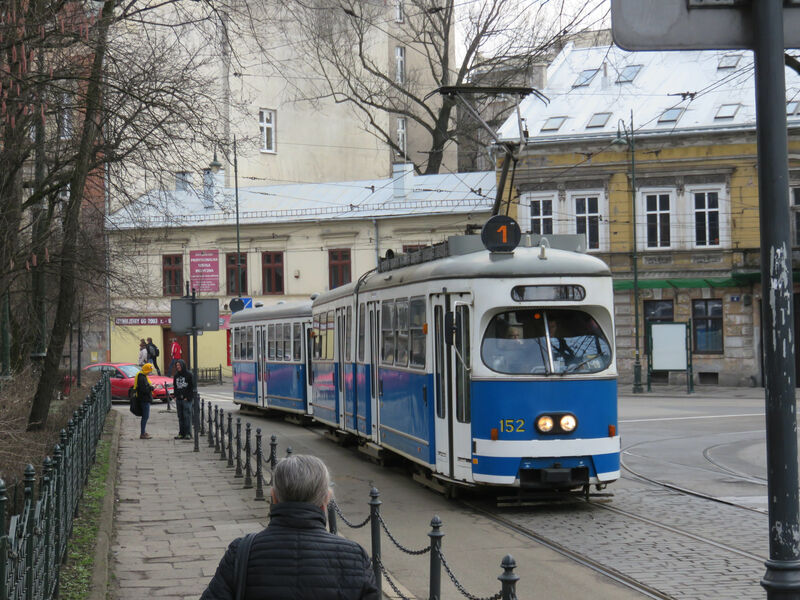 A partly modernised Konstal 105N. Picture from Bytom 29.6.2015 by Ilkka Siissalo. Another Silesian Konstal 105Na tram, this time in Częstochowa. 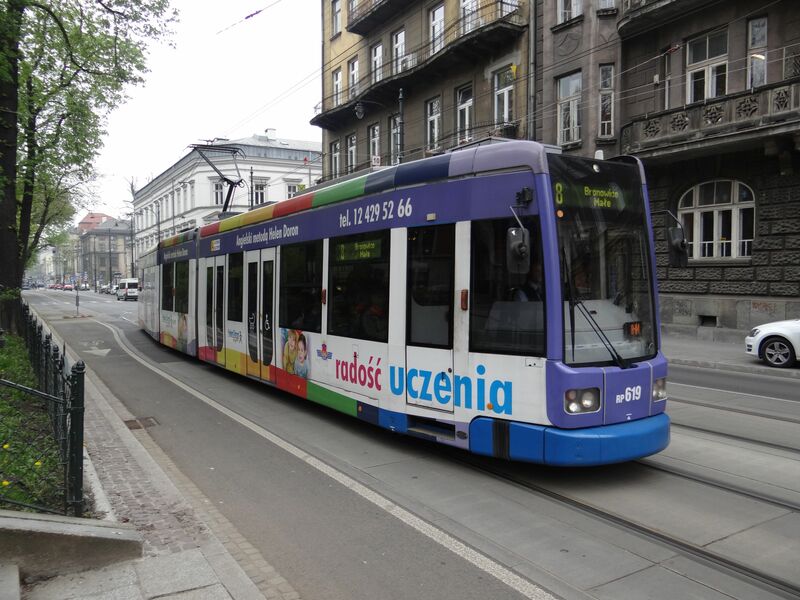 The tram system in Częstochowa is a separate network from the rest of the Silesian tram system, but it shares the same colours. 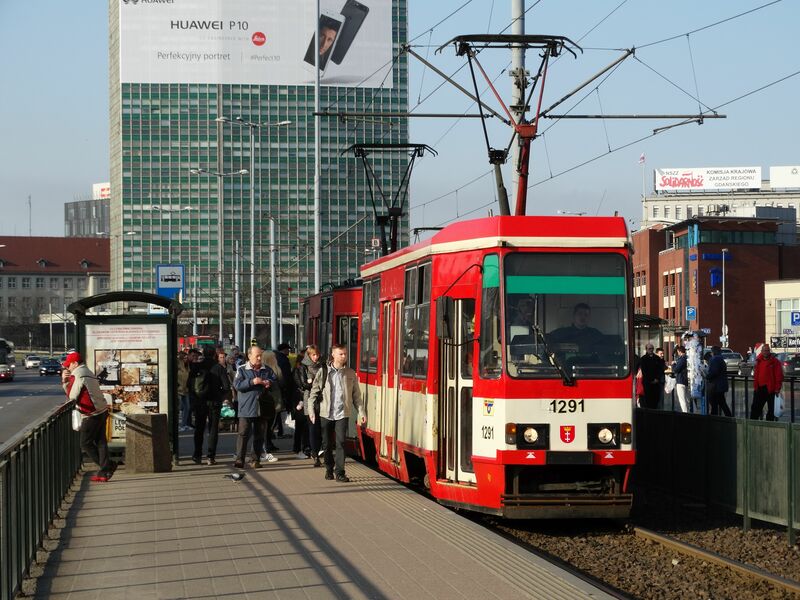 The network, Tramwaje w Częstochowie, was opened in 1959. They have 48 Konstal 105Na trams and seven modern Pesa Twist trams. There are three lines and the whole system is just 14,7 km long. 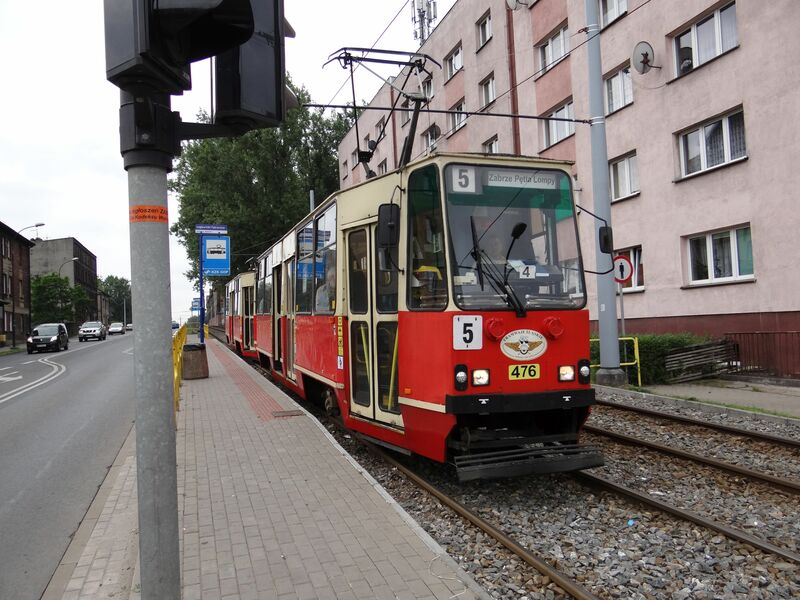 Picture in Częstochowa 28.6.2015 by Ilkka Siissalo. One of the seven new Pesa Twist trams of Częstochowa. 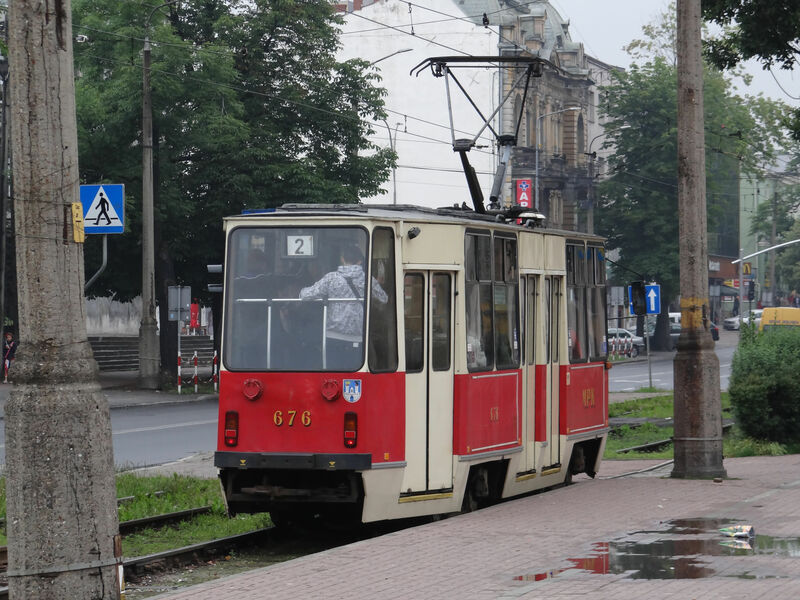 Picture in Częstochowa 28.6.2015 by Ilkka Siissalo. Another view of the same Pesa Twist. Picture in Częstochowa 28.6.2015 by Ilkka Siissalo. The then German city of Stettin got its first trams in 1879. 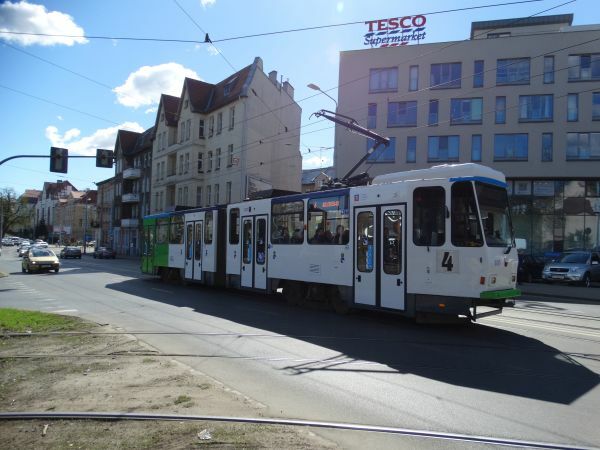 Today Szczecin has 60 km of 1435 mm tram track electrified with 600V DC. 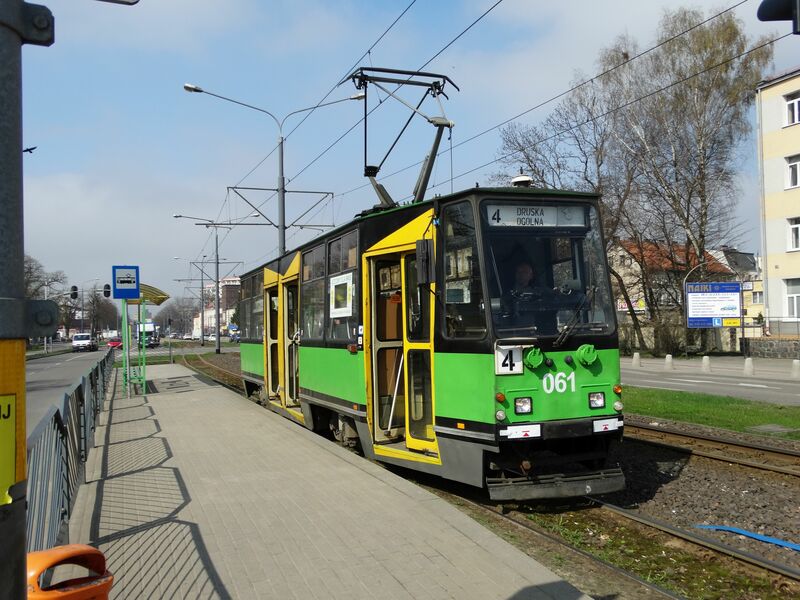 This tram no 602 is a Moderus Beta from the year 2014. Picture by the Szczecin glowny (main station) 6.4.2017 by Ilkka Siissalo. 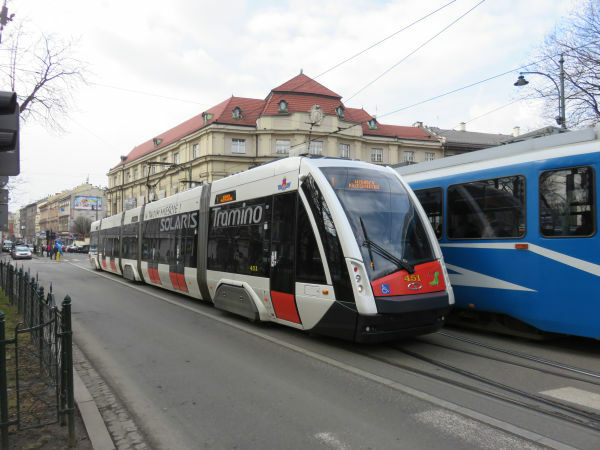 Two trams of the type Tatra KT4Dt at the main station on line 3. Picture by the Szczecin glowny (main station) 6.4.2017 by Ilkka Siissalo. 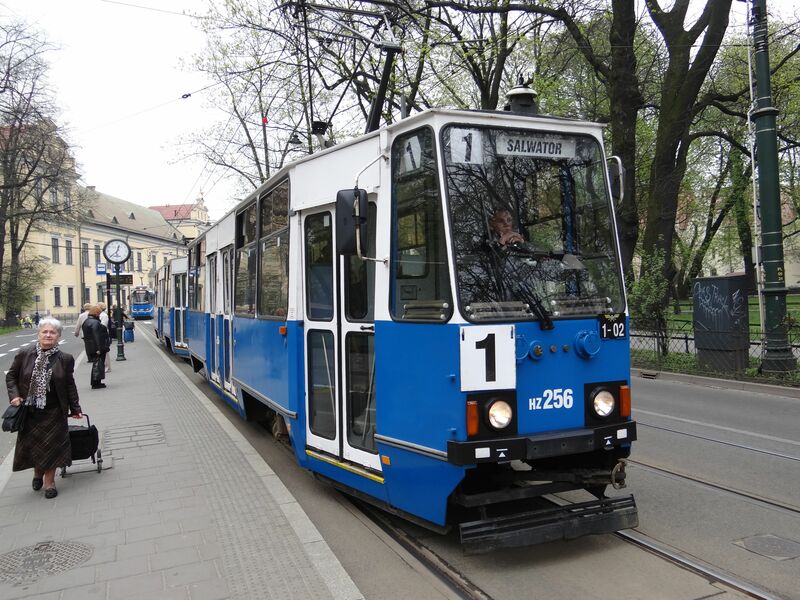 Another Tatra KT4Dt on line 4. Picture in Szczecin 6.4.2017 by Ilkka Siissalo. 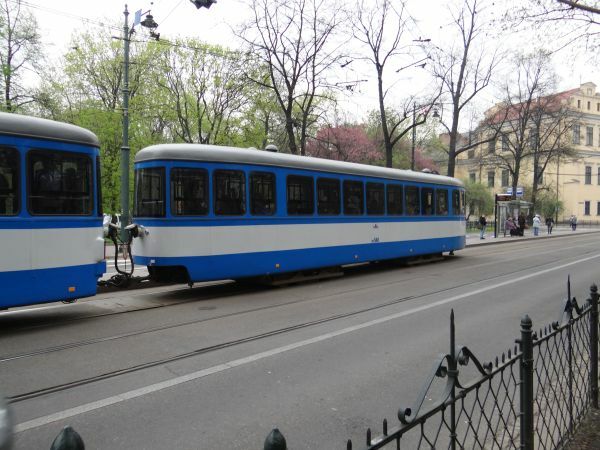 Two trams of the type Tatra T6A2D. Picture by the Szczecin glowny (main station) 6.4.2017 by Ilkka Siissalo. Two trams of the type Moderus Alfa have just left the tram stop of the main station and are turning south to the Kolumba road. Picture by the Szczecin glowny (main station) 6.4.2017 by Ilkka Siissalo. 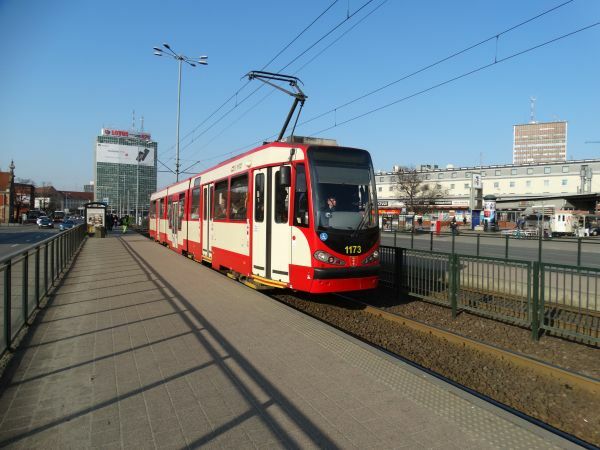 A pair of Moderus Alfa trams arriving at the Szczecin main station. Picture by the Szczecin glowny (main station) 6.4.2017 by Ilkka Siissalo. 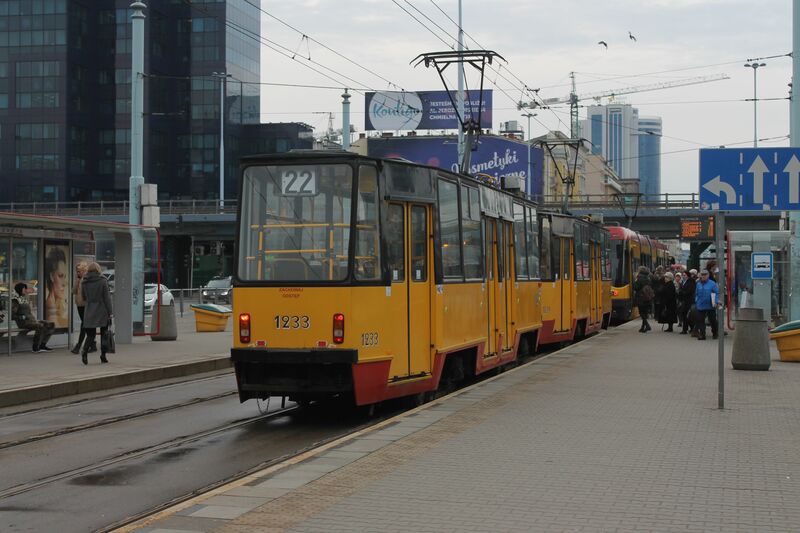 These two trams are from the old communist Polish times, but they have been slightly modernised. 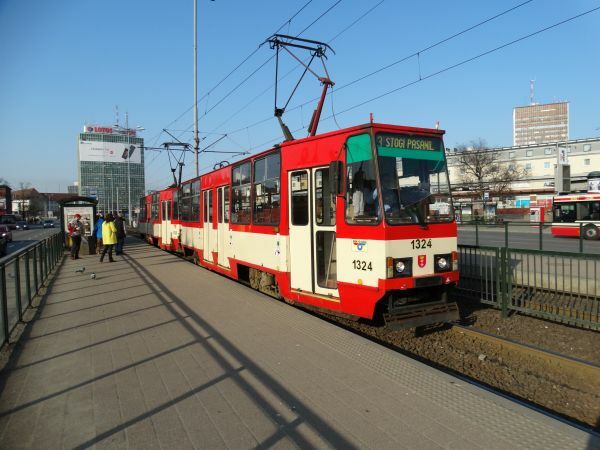 They are of the old Konstal 105Na or Ng type, but the one at the front has for example received an air conditioner on top of the drivers cab and new LED headlights. The one at the back has lost its drivers cab and also headlights totally and there are now passenger seats instead of the place for the driver. Picture by the Szczecin glowny (main station) 6.4.2017 by Ilkka Siissalo. This is a Pesa 120Na "Swing", one of Szczecin's newest trams, here on line 7. Picture 6.4.2017 by Ilkka Siissalo. 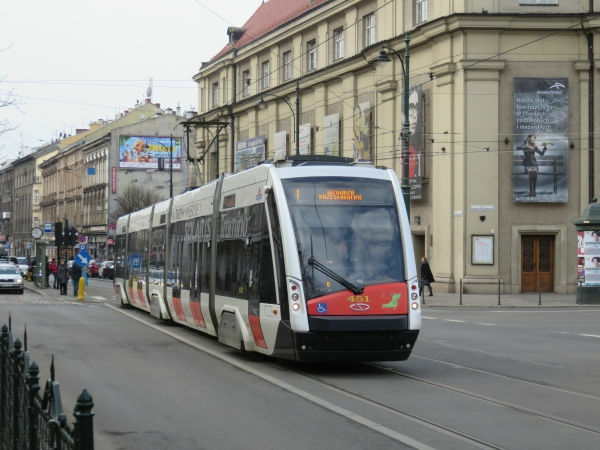 Another view of the same Pesa 120Na "Swing" on line 7. Picture 6.4.2017 by Ilkka Siissalo. 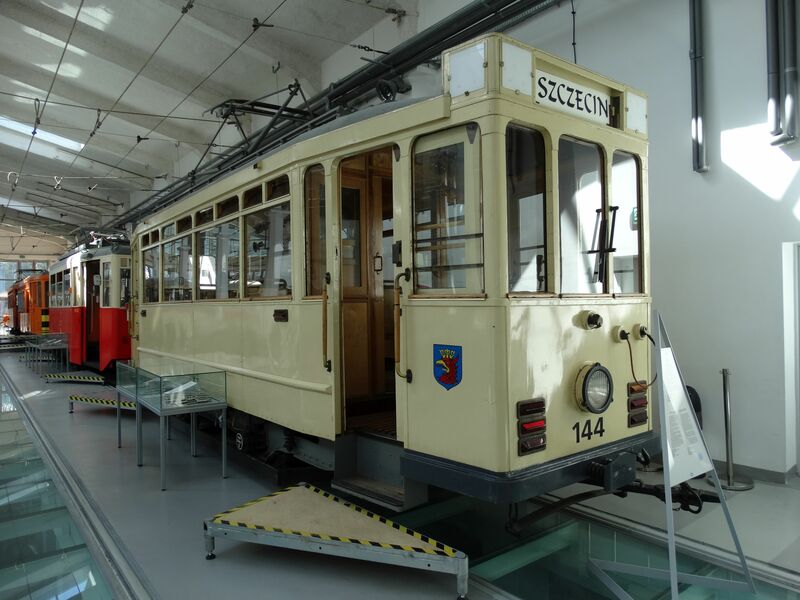 Szczecin's oldest tram, the "Bremen no.144" was delivered to what then was German Stettin in 1926. In 1967 it was turned into a technical support vehicle and it kept carrying technical support crews until 1995. Picture at the museum of transportation and technology 6.4.2017 by Ilkka Siissalo. The inside of "Bremen 144". Picture at the museum of transportation and technology 6.4.2017 by Ilkka Siissalo. This class Nk tram was built in Chorzow in 1951 and it was in use until 1996 in Warsaw and Szczecin. Picture at the museum of transportation and technology 6.4.2017 by Ilkka Siissalo. Inside of the "Nk 114". Picture at the museum of transportation and technology 6.4.2017 by Ilkka Siissalo. When they were new in 1971 these Konstal 102a trams were considered absolute luxury. Amongst the many nicknames they had, one was "lux-torpedo". The last ones were taken out of service in 2007. Picture at the museum of transportation and technology 6.4.2017 by Ilkka Siissalo. One of the Konstal 105a trams of Szczecin as they used to be during the communist times. Picture at the museum of transportation and technology 6.4.2017 by Ilkka Siissalo. 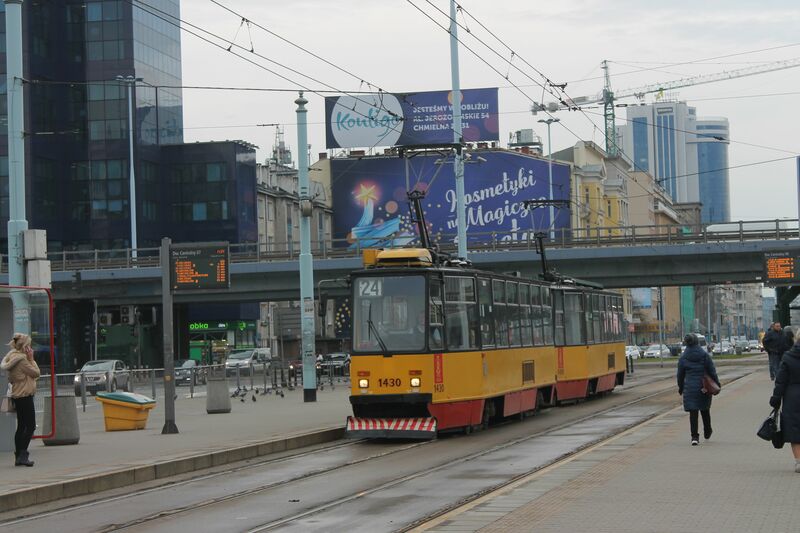 A modern Pesa Swing tram (Pesa 120Na) approaching the central station tram stop in downtown Warsaw. 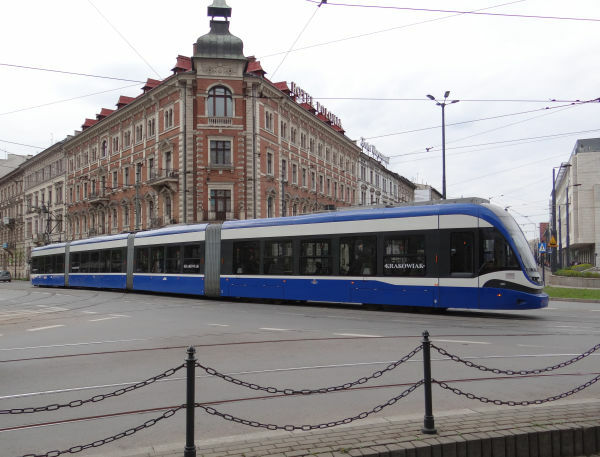 These new low-floor trams have been built 2012-2015. Its floor height is only 350 mm. It takes 40 people seated and 161 standing passengers. 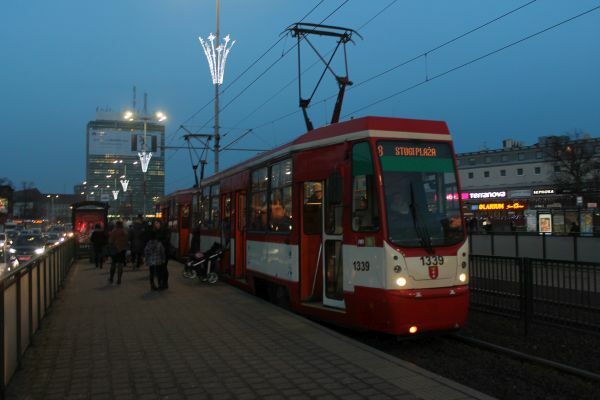 Picture at Warszawa Dworzec Centralny (Warsaw central station) 28.12.2017 by Timo Varshukov. A pair of old Konstal 105N trams. 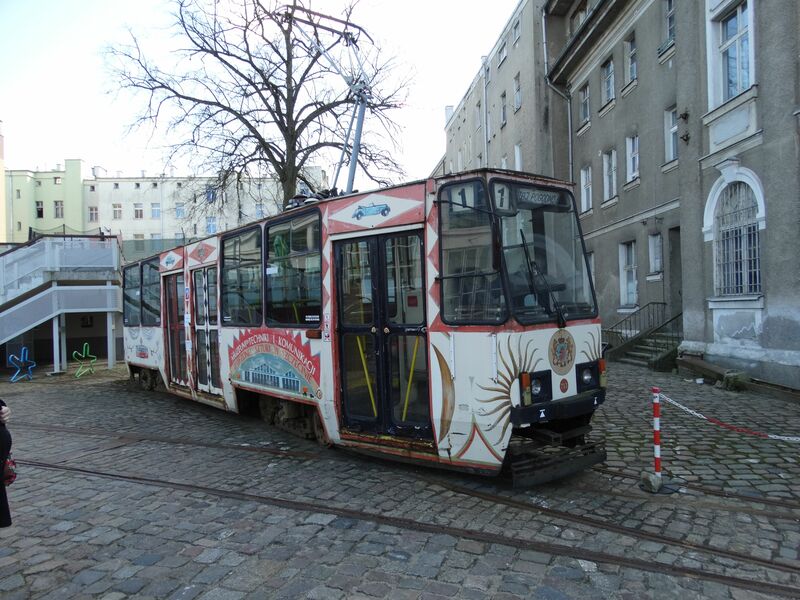 The first one has been slightly modernised: It has at least new lamps and an air conditioner on its roof. Same old pair of Konstal trams as in the picture above, but now seen from behind. Another pair of Konstal trams on line 24. Note the new air conditioner on the roof of the first wagon. The driver will have it cool and nice even as passengers have to sweat. Note also the snow plough.